The crack of the bat echoes through Safeco Field (now T-Mobile Park) as Dee ‘Flash’ Gordon takes off to first base. From not far behind the catcher, a small group shares cheers of excitement and sighs of disappointment throughout the game. 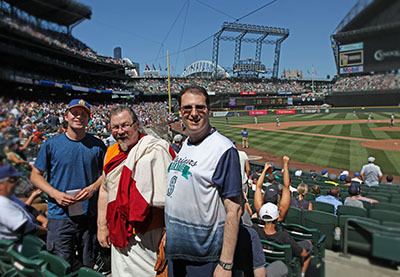 This small group at the Seattle Mariners home game includes staff and clients of Supportive Living Services (SLS) at Jewish Family Service. Their comradery begins building on the way to the game as they discuss division rankings and the finer distinctions between the American and National leagues. They are busy catching up with one another and getting to know others in the group, because baseball is not the only reason they came out. “Here, it’s more of a community thing,” Thomas* said. “The noise, the comradery and the smell.” Waves of cheers and unified chants, the buzz of discussion with those around you, the scent of fried food and sunscreen. That community feeling is particularly meaningful and rare for people who can often be isolated or feel alone because of their mental health. JFS knows that community is not just a desire, but a need that can affect mental health outcomes. Barriers — of expense, transportation, access to care, mental health and misconceptions about mental illness — can limit, and at times, prevent people from engaging in community experiences and building relationships. JFS helps reduce or manage those barriers and offers people the opportunity to join activities with others. Reducing barriers includes providing donated tickets and transportation to events, providing a safe space for clients to feel valued, as well as recognizing and supporting individual needs during the event. When there is a sense of trust, support and community, a win for the home team is just a bonus. Thank you to the companies and individuals who donate tickets to events and make these engagement opportunities possible.